I only started working with glass in 2004 so I was a bit anxious when I began the MA Glass programme at the renowned Welsh School of Architectural Glass in September 2010. Most people thought I had finally lost the plot, travelling from West Kent to Swansea once a week for two years. But those two years were amazing. I met a diverse range of incredible people, all highly skilled and passionate about glass in all of its forms. My career to date has focused on commercial interiors and how space can be designed or adapted to support or influence behaviour; typically communication, collaboration or concentration. I used that experience to inform my architectural glass study, and I combined it with my interest in interactive art so that my audience might actively engage and interact with my work in some way, rather than passively view it. Research Methods and Contextualising covered in the MA Glass programme have direct relevance to workplace strategy, so Art and Strategy combined well for me. 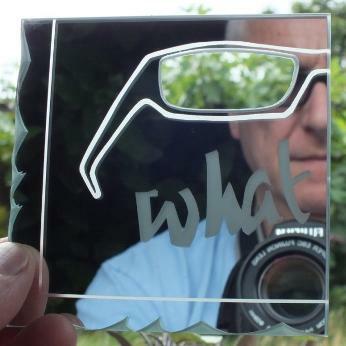 Many thanks to Pippa Stacey and Chris MacCormick for initially inspiring me to work with glass; to fellow students Themis, Ray, Dena, Wadia, Ella, Ian and Yvonne for making my learning experience so enjoyable; to Chris Bird-Jones, Vanessa Cutler, Rodney Bender, Lisa Burkl and Colin Telford for their knowledge and guidance; to Jon at UKwindowFilms for invaluable help with my major project; and to my neighbour, Hildegard Pax, for acting as a sounding board and patiently providing encouragement when my experiments were going pear-shaped.